During you time with Assassin’s Creed Odyssey, you will spend a lot of time on your ship out on the seas. Your ship won’t be much to look at when you are first starting out, but as you progress through the game, you will unlock ways of customizing it to look better. To help you do just that, here’s how to customize your ship in Assassin’s Creed Odyssey. You can customize your ship from the player menu. Look for the Ship tab. After you’ve taken control of The Adrestia in The Big Break story mission, you will gain access to a Ship tab on your menu screen. This tab allows you to customize a number of different options on your ship including Ship Cosmetics, Special Lieutenants, Arsenal, Weapons Damage, and Ship & Crew Endurance. Customization of each of these options will change both the look and power of your ship. To get a better idea of each option, let’s take a look at them individually below. Ship cosmetics change how your ship and crew looks. You can change things like the sail and hull paint scheme, the ship’s figurehead (what goes on the bow), and how your crew looks visually. Ship cosmetics come in varying degrees of rarity all the way up to Legendary. You can purchase or find ship cosmetics out in the world by defeating other ships, completing side mission, and even beating the game. Think of Special Lieutenants like passive buffs to your ship. These characters can be equipped on your ship to give you a boost in things like bow damage, ramming damage, javelin damage, stamina refill, and so on. You will only be able to have one Special Lieutenant equipped on your ship to start, but if you improve your ships hull, you can have up to a maximum of four equipped at one time. Like the ship cosmetics, Special Lieutenants come in all varieties and can be found or recruited during your playthrough. Each of these 9 upgrades will impact a different aspect of your ship, so think wisely about which upgrade to make. In total each upgrade can be made 4 times, meaning there are a total of 36 upgrades you can make. 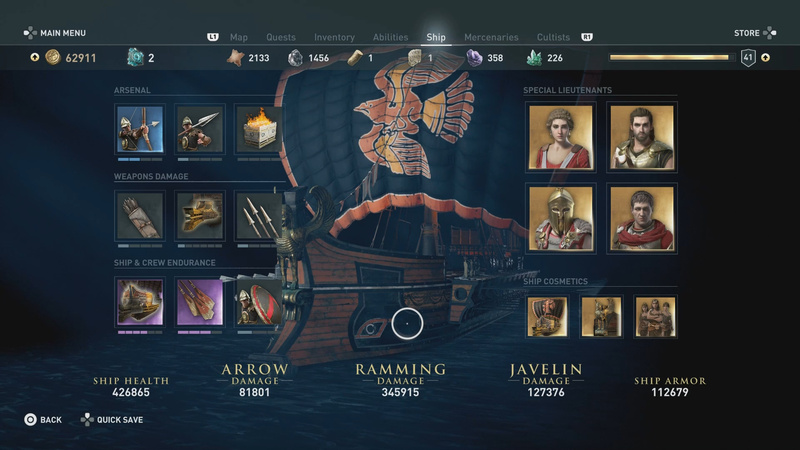 Upgrading your ship takes a collection of materials including Iron Metal, Soft Leather, Ancient Tablets, and Drachmae. Hopefully this guide pointed you in the right direction for upgrading your ship in Assassin’s Creed Odyssey. Check out our other guides on the game, including The Blind King quest guide, how to get Legendary equipment, and how to access your DLC items. Anything to add to our how to customize your ship in Assassin’s Creed Odyssey guide? Drop it in The Pit below. Am I the only one that thinks most of the ship skins don’t look that good? At least give us some interesting Legendary ones.